In today’s SoC designs, the level of interaction between analog structures and digital logic is dramatically more complex than in the past, where divide-and-conquer approaches to design and verification proved adequate. This interdependency creates a requirement for a mixed-signal approach to verification. 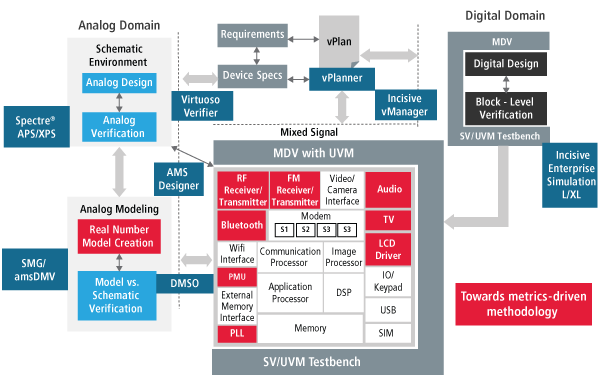 Mixed-signal verification, at its root, still begins with analog behavior being captured and simulated within the analog design environment. However, as the analog and digital blocks are merged, using even the fastest analog circuit solvers becomes a runtime bottleneck in the verification closure process. Digital designs have long had the benefit of MDV, where verification plans are tailored to given specifications, progress is tracked closely, and designers can determine exact verification coverage levels. Analog designers continue to focus on designing and verifying high-performance analog, zeroing in on analog parameters including transient and DC analysis. At the SoC level, they integrate the analog as black boxes. The SoC verification engineer typically ignores analog functionality and performs bare-minimum testing, with very limited interaction between digital and analog blocks. This approach results in errors and re-spins. To support these advanced verification techniques, the analog side of the house has several advanced capabilities. The Virtuoso® schematic model generator (SMG) enables the creation of wreal models of analog. The amsDmv tools enable validation of these behavioral models for functional equivalence against the analog design, comparing the representation of the same design at different levels of abstraction. Virtuoso Verifier allows collection of analog coverage of the analog design within the Virtuoso custom and analog design environment. In addition to tapping into our Virtuoso environment, our digital/mixed-signal verification flow also takes advantage of our Incisive® simulation technologies. As you move your design to a higher level of abstraction, the flow provides an increased level of automation and real-time modulation. Eventually, all aspects of the design could be driven by a MDV methodology, with prepackaged UVM components. To enable power-aware verification, Incisive simulation technologies also support CPF and UPF-IEEE 1801 standards for both digital and mixed-signal designs. With Cadence’s complete digital/mixed-signal verification flow, you’ll be able to address all aspects of the verification process, while balancing the needs of speed versus accuracy in a unified environment. Because today’s mixed-signal designs have multiple feedback loops through analog and digital domains, the “black box” approach is no longer possible for top-level verification. The new world is a complex, multilayered fusion of the two disciplines, where the boundaries are fuzzy and the interactions complex and, at best, poorly modeled. Cadence offers an integrated mixed-signal verification environment that ensures the reliability of the mixed-signal verification results.